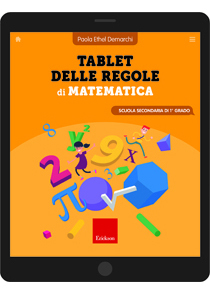 Like a real tablet, practical and handy, where all information can be instantly found with a simple touch, this volume collects the main rules, definitions, properties and procedures of mathematics used in secondary school. Easy to consult, thanks to a clear and clean color graphic design and the adoption of a lexicon that is as simple and immediate as possible, it is an indispensable tool for all first-level middle school students, teachers and parents alike. It can be very effective for students with Specific Learning Disorders. The order in which the topics are presented follows the progressive level of difficulty of the subject as it is dealt with from the first to the third year of middle school. Each topic is introduced by an anticipatory map, which provides an overview of the concepts addressed, activates previous knowledge and helps to orientate and focus on the fundamental points. Each page is dedicated to the explanation of a rule or a procedure and is introduced by an illustrated comic that anticipates the content, anchoring it to the daily reality of young people so as to overcome the idea of ​​mathematics as an abstract and detached subject. The presentation of the calculation procedures and problems describe the mental and written procedures necessary to arrive at the final result in a clear and gradual way, accompanying the child, step by step, to the correct understanding and resolution of the procedure. Immediate help is also offered by the tables proposed inside the cover flaps, useful tools for quick reference of the main formulas to always be kept handy. A book that makes the entire middle school math program available in a simple summarized format. Like on a real tablet, where all the information can be instantly found with a simple touch, this volume is a collection of the main rules, definitions, properties, and mathematical procedures used in middle school. The clear and clean graphic design and the adoption of a simple and immediate language make it a simple and easy tool to use, particularly for students with Specific Learning Disorders. The Table of Math Rules is organized in four sections: Numbers, Space and shape, Relations and functions, Data and predictions, each of which, signaled by a different colour, presents the main rules of the topic presented. The order of the topics follows the progressive levels of difficulty with which the subjects is presented from the first to third years of middle school. Each page is dedicated to the explanation of a rule or a procedure and is introduced by an illustrated cartoon about the topic, linking it to the daily reality of the children. This helps the pupils overcome the idea of ​​mathematics as a "distant" and abstract matter. The pages of rules are organized in the same way and follow the same structure, using certain graphic features: boxes with the definition of the rule, numerical examples and geometric figures, «Remember» and «Attention» boxes, diagrams and charts. The pages of procedures present the step by step process for solving calculations and problems. They contain both explanations of procedures, identified by a title and accompanied by numerical examples, and problems to be solved by applying the rule learned on the previous page (in this case untitled). Each topic of the book is introduced by an anticipatory map that provides an overview of the concepts dealt with, activates previous knowledge and helps students to orient themselves and focus their attention on the fundamental points. Paola Ethel Demarchi Graduated in Mathematics at the University of Turin, she obtained a specialization for support activities with pupils with disabilities in secondary schools and the I level master in Didactics and Psycho-pedagogy for learning disorders. Author of texts and scientific articles, she teaches mathematics in secondary school.